Facebook asks me to update my security information. I dutifully give them the requested information. Then they ask for an answer to a security question. I enter the name of the street I lived on when I was 8 years old. Facebook tells me that answer is not allowed. I am not allowed to have lived where I lived when I was 8 years old? So, I look for another security question to answer. The choices are few. Other than my driver's license number, which of these are questions only I can answer? Might any of my Facebook friends -- many who knew me as a child -- know the answers to any of these? Do I really want my security question to be something my mother can answer? 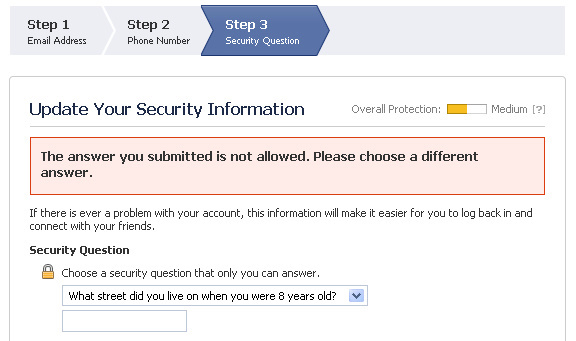 There is nothing secure about securing my account with answers to any of these security questions.